Born in London in 1960 to parents who immigrated to the UK from the Caribbean island of St Lucia, Isaac Julien is known for making multichannel media installations, feature-length films and television documentaries that address issues related to identity, sexuality, social displacement and history. Shot primarily in China with a cast and crew including the actresses Maggie Cheung and Zhao Tao, the artist Yang Fudong and the cinematographer Zhao Xiaoshi, Julien’s latest project Ten Thousand Waves developed from an incident that occurred in northwest England in 2004, the Morecambe Bay cockling disaster, in which 23 illegal Chinese immigrants who were picking cockles on the beach drowned after they were caught in rising tides. The incident helped draw attention to the exploitative underground systems affecting immigration in the UK. Using allegory to trace the lives of the Morecambe Bay cockle pickers back to their origins in China’s Fujian province, Ten Thousand Waves takes shape as an immersive nine-channel projection, with the screens arranged in the exhibition space to dynamic effect. The footage includes scenes reinterpreting the myth of the goddess Mazu, a protector of seafarers and travelers who is still worshipped today, as well as scenes shot in present-day Shanghai, documentary footage regarding the Morecambe Bay incident and archival footage from Cultural Revolution-era China. Over the length of the film’s 49-odd minutes, voice-over narrations recite poems written by the poet Wang Ping eulogizing the Morecambe Bay cockle pickers, creating an eerie contrast with the often spectacular and mesmerizing imagery unfolding across the screens. As a companion piece to 2007’s Western Union: Small Boats, about would-be immigrants who sail from the shores of Africa to Europe on makeshift boats, with many dying along the way, Ten Thousand Waves not only underscores the risks people take to seek better lives, it also examines how narratives cross borders and adapt to new contexts, and how storytellers, too, are swept along by this process. As such, the work touches upon still unsettled debates about the agency of storytelling in an always incompletely globalized world, suggesting not only an allegory of a specific, tragic incident but also an allegory of the narrative of Modernism itself, and its refraction across multiple international contexts. ART iT met with Isaac Julien in Shanghai following the China premiere of Ten Thousand Waves at ShanghArt Gallery to discuss the work and the issues it raises, as well as its relation to his previous projects. Isaac Julien: Photo Jonathan Root. Isaac Julien on the relations between his work, post-colonial theory and Quentin Tarantino. 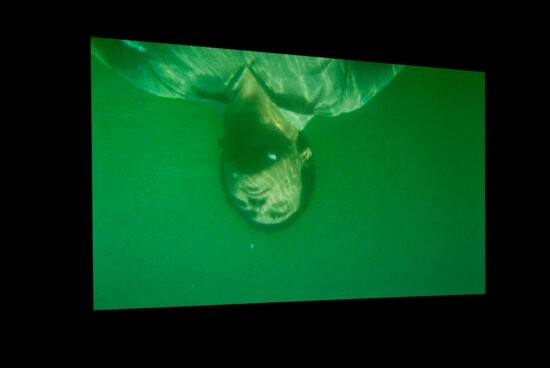 Installation view of TEN THOUSAND WAVES (2010) at ShanghArt Gallery, Shanghai, 2010. Nine-screen installation, 35mm film transferred to High Definition, 9.2 surround sound, 49 min 41 sec. Photo Adrian Zhou, courtesy of Isaac Julien and ShanghArt Gallery, Shanghai. ART iT: Your works to date, including Vagabondia (2000), Paradise Omeros (2002), Fantôme Créole (2005) and Fantôme Afrique (2005), can be viewed as expressing a post-colonial sensibility. With Ten Thousand Waves, what happens when you move out of the post-colonial context and come to China? Did you think much about that as you were preparing the work? IJ: I started researching Ten Thousand Waves in 2004. A few years later in 2007 when the curator Mark Nash was invited to participate in a platform panel for the third Guangzhou Triennial, organized by the curators Gao Shiming, Johnson Chang and Sarat Maharaj, I attended as part of a research trip for the project. The theme of both the panel and the triennial was “Farewell to Post-Colonialism,” and it was a very interesting readjustment for me to come to the Middle Kingdom and witness this refusal to be constructed within the post-colonial paradigm. I thought it was interesting to repudiate that paradigm and it proved very instructional, giving me many questions to consider, which in turn helped reframe a possible approach to Ten Thousand Waves. In London in the early 1990s there was a particular moment when British cultural studies, post-colonial studies, psychoanalysis, Derrida and so on all intersected and there were many different theories in circulation. That was a high point in cultural theory and its translation into the visual arts, and you could say this was part of a generational shift in interest that culminated in Okwui Enwezor’s documenta11, in which I participated through the Creole and Creolization platform by showing Paradise Omeros. On a subsequent trip to China I visited several universities and some Chinese cultural-studies scholars told me that they actually do use post-colonial and cultural-studies theories in their work. I sometimes think of all the complaints I tend to hear in New York about all the other biennales in the world – “Oh there’s a biennale here, there’s a biennale there” – but the cultural-studies discourse in Britain has been instrumental in the recognition that there have always been different Modernisms and different negotiations with the West in art from different parts of the world, one example being the work of Stuart Hall. It is this theory that has been the most receptive to ideas and formations from “elsewhere,” but I completely understand why post-colonial studies might become a contested paradigm. ART iT: But in terms of “constructing others,” couldn’t the post-colonial position be mooted if you’re not concerned about establishing your subjectivity in the eyes of the West? IJ: I completely agree with you, but are the eyes of the West completely mooted in the so-called East? Can we really say “farewell to post-colonialism” for good? As a friend once said to me, “Farewell post-colonialism, hello market!” Just look at the bombardment of advertisements for international brands here in Shanghai. I’m not sure if China is completely free from the gaze of the West, especially since I am in the business of making images as an artist and filmmaker. Witnessing the circulation of Western images here, I think there is a certain dominant subjectivity being articulated in these images, which is too strong to ignore. This is another space that needs to be explored for an artist like myself: the psychic space of images. Both images: Untitled (from Mazatlán) (2001), Duratrans in lightbox, 51.5 x 39 x 12.5 cm. Courtesy of the artist and Victoria Miro Gallery, London. ART iT: To what degree do your works come from a personal, non-theoretical or atheoretical place? One thinks here of the connection between your own family history and the Caribbean island of St Lucia, which was the setting for Paradise Omeros. IJ: I quite often interpolate theoretical ideas into my own work even if they’re not always obvious or transparent. When I make a work I want to translate those ideas into another form and that is where poetry becomes very important, or the aesthetic use of devices like sound and color or “parallel montage.” My editor Adam Finch and I developed the latter technique whereby, rather than editing in the strictly linear sense of the traditional film, we edit several screens at once to form an architectural space. These formal elements are just as important as the other themes but are seldom discussed by critics, perhaps because it is easier to talk about post-coloniality. So in my work there’s always a conversation between the themes and the aesthetic strategies, and the aesthetic strategies in turn engage in other conversations beyond the terrain of the work itself. In Mazatlán, it’s a conversation with performance art and the construction of the Hollywood Western. And in Ten Thousand Waves, it’s a conversation with 1930s Shanghai cinema, or with the contemporary installation works by the Shanghai-based media artist Yang Fudong. In other words, I hope there’s a degree of transnational reflexivity that informs my practice. 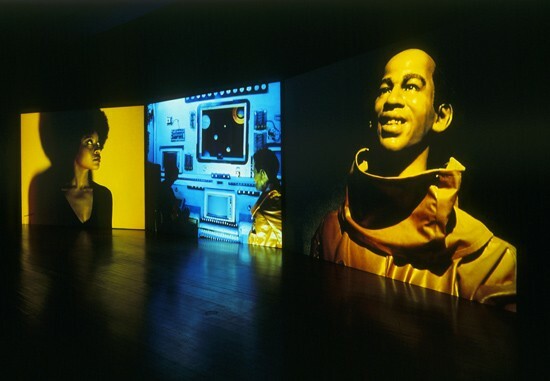 Installation view of Baltimore (2003) at the 3rd Berlin Biennial, 2004. Triple DVD projection, 16mm film transferred to 3 DVDs, 5.1 Sound, 11 min 36 sec. Courtesy of Isaac Julien and Victoria Miro Gallery, London. ART iT: In cinema right now Quentin Tarantino is well known for conversing with other genres and using a similarly reflexive approach. Do you follow his work at all, or is it just happenstance that there’s a parallel there? IJ: I’m an admirer of Tarantino, although I’m not sure that we use the same reflexive approach. I interviewed him for my documentary Baadasssss Cinema (2003), which was a quite ironic yet also researched film essay about Black action films from the 1970s, and that research informed the making of the subsequent work Baltimore (2003), which is my futuristic Sci-Fi-Blaxploitation media-installation piece. I think that my initial conversation with Quentin was something of an homage to him, and in fact I wanted him to play a character in Baltimore alongside the Black action-film director and actor Melvin van Peebles, who directed the classic Sweet Sweetback’s Baadasssss Song (1971). But at the same time, of course I see myself as being quite different, and I’m sure Quentin sees himself as being quite different from me! ART iT: If your approach for Baltimore was both ironic and researched, does that preclude any attempt to identify with the material? IJ: Baltimore developed out of quite a lot of research. I taught a course at Harvard in 2000-02 titled “Blaxploitation Cinema to Quentin Tarantino,” so it was through those debates with students and showing them those works that I began to build my ideas. My work is in fact rather oppositional and antithetical to Black action films because I want to repudiate stereotypes in some ways or re-articulate them to reveal a hidden sign. But what I realized from the making of Baltimore – and this also connects to Mazatlán – is that perhaps we cannot quite live without the hyperbolic references to representations. We are to an extent beholden to signs, even if we act in a politically progressive way against them, and even if we want to repudiate them. Here I’m evoking theorists like Judith Butler and her early work around dis-identification, but of course all of those ideas are at work in the mechanisms and the apparatus of moving-image culture generally. 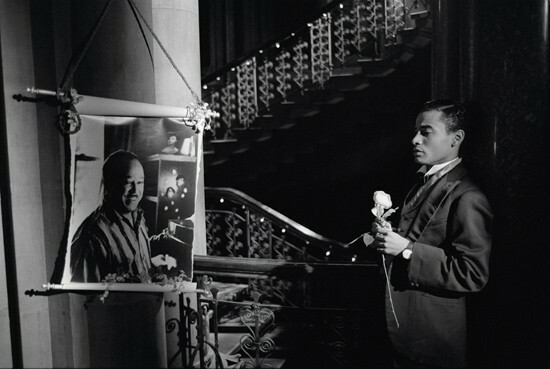 Isaac Julien and Sunil Gupta – Homage Noir (Looking for Langston Series) (1989). Courtesy of Isaac Julien, Sunil Gupta and Victoria Miro Gallery, London. ART iT: Well there’s definitely an ambivalence apparent in Baltimore, because you wonder whether it’s a celebration or a critique. And then of course Looking for Langston can be seen as a celebration of the Harlem Renaissance poet Langston Hughes, but it also ended up in a controversy with his estate over your depiction of his sexuality. IJ: That’s right. It is an inquiry into ambivalence and what that produces, because I am not African-American, even though I’ve made films that are in conversation with African-American cultures. I think this ambivalent position gets constructed because of my position as an outsider or as a native informant. I say that, but of course I grew up watching Blaxploitation films in the same way I grew up watching Kung-Fu films, so in terms of popular culture it’s something that we have all to some extent enjoyed and have therefore been contaminated by, and with which we have a relationship. From Sarat Maharaj, “Sublimated with Mineral Fury: prelim notes on sounding Pandemonium Asia,” Farewell to Post-Colonialism: The Third Guangzhou Triennial (Guangzhou China Fine Art Academy Publishing House, 2008) 52.